Our Church gives us, on this fourth day of Christmas, the liturgical commemoration of the baby boys –martyrs — the very first martyrs (you’ll recall that Saint Stephen, whose feast was commemorated on December 26th, was the first martyr of the Age of the Church). 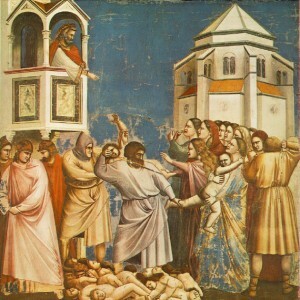 Scholars tell us that Bethlehem was a small town so the the number of the Innocents was probably no more than 25. These boys died not only for Christ, but in His place. The vestments are red or purple, the color of mourning; the Alleluia and Gloria are not sung.